Remember: this car is from 1932. It’s a full-bodied car – there aren’t any running boards and yeah, the front wheels kind of have their own fenders – but for the most part, this thing looks way ahead of its time. But it’s pretty advanced under that strange, tan bodywork too. The engine is a 151 horsepower 6.0-liter V-12 (Marmon had just started production on their V-16 powered car. This was essentially a V-16 minus four of the cylinders). The suspension set-up was different from most production cars of the day, ending in low un-sprung weight. The body was designed by an M.I.T. student and the car cost Howard Marmon about $160,000 of his personal fortune to build. His company went bankrupt the following year. So Marmon shopped the prototype around, hoping someone else would put it into production, but no one took the bait. So he brought it home and packed it away. Marmon died in 1943. It passed through a few hands before it was given to Brooks Stevens, who painted it blue. It was purchased (with money, for the first time in the car’s history) in 1999 and completely restored in 2001. This car is one of one and failed to sell at an RM Auction in 2011 for $475,000. I guess the owner wants more than that if it is to sell this time around. Click here for more info and here for more from RM at Amelia Island. 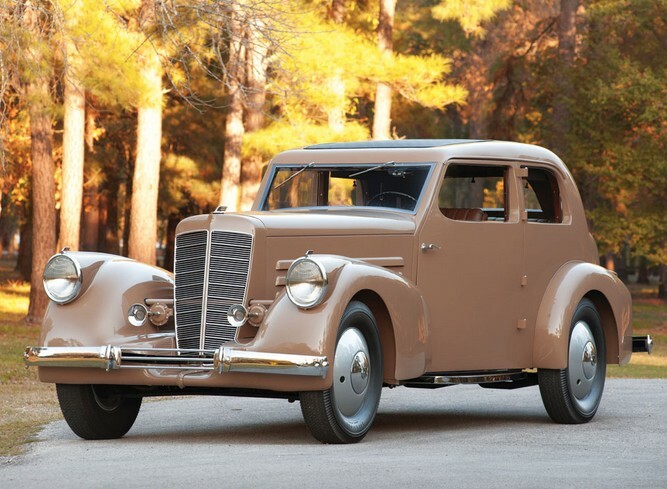 This entry was posted in Uncategorized and tagged 1932, 2-door sedan, auctions, cars, classic cars, hcm, marmon, prototype, rm auctions, v-12 by ClassicCarWeekly. Bookmark the permalink.